Have you wondered what the best mom-friendly city is to live in? Do you feel like your city is one or not? Well, check out these survey results from Teleflora and Sperling's! Just in time for Mother’s Day, Sperling’s BestPlaces has partnered with Teleflora to announce the nation’s “Top 10 Mom-Friendly Cities.” San Jose, California is the clear front-runner offering the best quality of life for moms and raising a family. The survey found that the Silicon Valley city outranks all others with the most robust “mom-friendly” lifestyle offerings like readily-available child care and day care, pediatric physicians and family fun. San Jose may outrank all other cities on the Mom-meter, but it also has the distinct honor of ironically being the city to outrank all others for forgetting mom on Mother’s Day. Northern California cities took the #1 and #10 spots making California the “Mom-Friendliest State.” Ohio came in a close second. When it comes to what moms really want for Mother’s Day, Sperling’s BestPlaces asked about ideal gifts and celebrations. According to moms across America, her #1 desired gift is flowers and spending time with family at brunch or dinner, versus receiving a card in the mail.  50% of moms want flowers and brunch or dinner with their family.  24% of moms would like a handmade gift.  16% of moms prefer a spa visit.  10% of moms are happy with a Mother’s Day card. In the debate over what flowers to buy mom, the survey easily uncovered that moms prefer a mixed floral arrangement filled with a variety of the season’s freshest blooms as compared to a dozen roses.  41% prefer a mixed floral bouquet with the season’s freshest blooms.  26% would like a flowering plant.  18% selected a bouquet with roses.  15% want a bouquet with lilies. Mother’s Day Forget Me Not! As a nation, more than 80% say that their mom is “always remembered on Mother’s Day.” There are some exceptions to the rule, however, with nearly 20% openly sharing that they have forgotten Mother’s Day at some time in the past. 54% of moms across the nation say that they would like to be gifted at any time for Mother’s Day. One exception is moms in Oklahoma; where 70% of moms stated they want to receive their Mother’s Day flowers on the actual day. Californians spend the most in the nation with an average order of more than $40 on gifts of flowers and plants. Don’t forget to “Celebrate Mom” (Sunday, May 10, 2015!) with a beautiful bouquet from Teleflora! For me, it is one of the best gifts! I love decorating my house with fresh, beautiful flowers! Right now, I get to look at the beautiful Teleflora’s Artful Elegance Bouquet and it makes me happy every time I look at its beauty! No one epitomizes elegance more that your favorite matriarch. 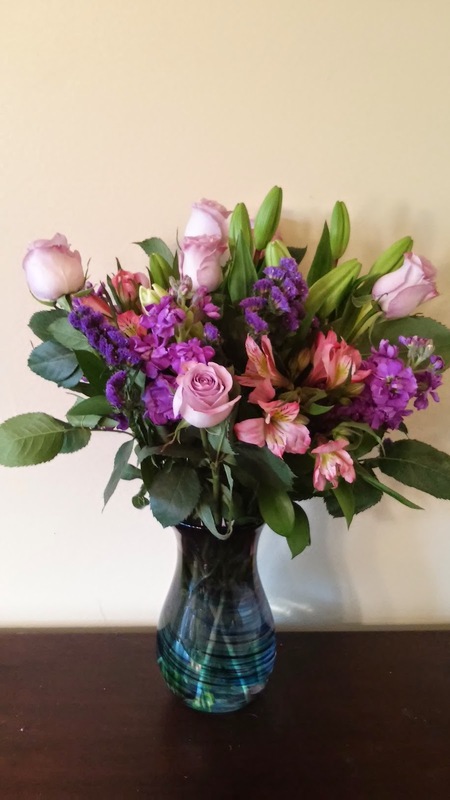 Now surprise her with this classic floral bouquet overflowing with lavender roses, white lilies, and fresh purple blooms in this exquisite Venetian hand-blown glass vase.